On Steeles Avenue, close to the large T&T Supermarket on Warden Avenue and not far from Highway 404, sits a bland two-storey building complex with a sad-looking fountain in front of it. This medium-sized unit is Metro Square, a Chinese mall built in 1997, with a more community-minded bent than Pacific Mall. In other words, think Eglinton Square Mall as opposed to Eaton Centre. What makes this mall slightly more unique is that it was designed for a Taiwanese audience. Unlike most other Chinese malls that are created with a Mainland Chinese or Hong Kong/Cantonese market in mind, this mall once bore a significant Taiwanese influence, with distinctive restaurants, bakery, grocery store and cultural centres prominent within its walls. Even the posters that used to adorn the food court were all promoting Taiwan tourism. As time marched on, the Taiwanese presence has waned somewhat (the aforementioned grocery store stocked with specialty goods from Taiwan went out of business, for example), but the mall itself remains worth visiting for the many interesting businesses that still populate it. The undoubted star of the show, the food court at Metro Square is rather small with only six stalls. However, the quality and variety on offer here is very impressive. 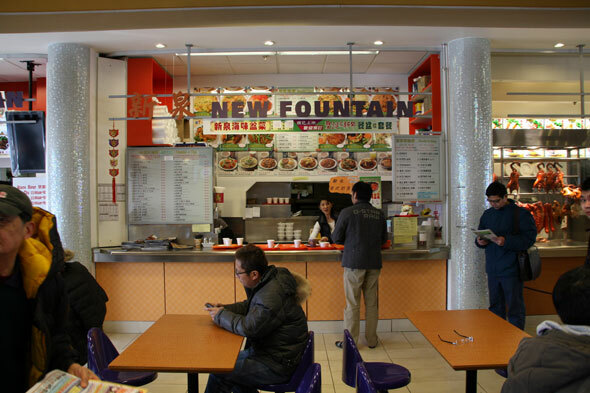 Renovated in early 2011, the food court is bright and spacious, and actually consists of six distinct Asian cuisines within those stalls. Highlights include the extremely delicious Taiwanese pork chops at Taipei Chin Yuan Pai Ku (best bang for your buck) as well as the tender baked Portuguese chicken at New Fountain Fast Food (a Canto-Western delight). For an average meal cost of around $7, you can't go wrong here. Every Chinese mall needs a bubble tea cafĂŠ, and Serissa Cate is the latest incarnation of the many tea houses that have occupied this spot. Modern and sleek, this new Asian cafĂŠ chain offers cheap drinks and desserts in a cozy, youthful setting. The service is very good, while the bubble teas on offer are par for the course like many of the other chains. Be forewarned though, there are times that the fruit component of your crepe/pancake dessert comes in the form of jam, and not real fruit. They also have free wi-fi, which is useful for looking up what "Cate" actually means. Part of the Ban Mu Yuan family of authentic Szechuan Chinese restaurants, this location is arguably the simplest looking of them all, but the taste and freshness is right up there with the chain's high standards. The spicy lamb with cumin is blazingly hot, tender, and flavourful, while many have argued that the spicy boiled fish (sui zhu yu) here is the best among the Ban Mu Yuan restaurants. Just remember that the food may look spicy enough, but it tastes even spicier. Those with weak taste buds definitely need not apply. Speaking of food for those with a braver palate, this restaurant offers spicy Chinese dishes from the Xin Jiang region of China. Influenced by its countless rulers (ranging from the Chinese to the Mongols), the cuisine from this area is rich in taste and bold in spices. Plus, it's also one of the few authentic Chinese restaurants that are halal, which is unsurprising given Xin Jiang's large Muslim population. Appropriately, you will find no pork here, but they more than make up for that with their extensive lamb offerings. Try the flavourful thick noodles with lamb, and don't forget to ask for their lunch specials (which offer delicacies like stir-fried lamb with chilli), available weekdays from 11 a.m. to 3 p.m. It goes without saying that a Taiwanese-centric mall should contain within its walls a well-known local Taiwanese bakery, and Jin Cheng fits this niche perfectly. Offering baked goods with a Taiwanese slant, this bakery carries many specialties that are hard to find elsewhere. One example is the gua bao, otherwise known as a Taiwanese hamburger, which is delicious braised pork sandwiched between two soft white Chinese buns and garnished with pickled vegetables. At $2 a pop and conveniently placed by the cash register, this is one lesser-known culinary treat that you should try. If you've ever wanted to cook your own dumplings and hold a little dim sum party in your house, then this is the place for you. Offering frozen pre-made dumplings ranging from pork to seafood, this is an easy and convenient place to buy those delectable delicacies in bulk (with some offerings as low as $5 a package), to enjoy with your family in the comfort of your own home. Make sure you try their red bean paste cake, a sweet ending to your dim sum meal. The quintessential modern Chinese food chain, you pretty much know what you're going to get when you step into an Asian Legend restaurant: semi-upscale ambience, extensive menu offerings, good service with servers that speak English quite well, and of course, delicious food. While some locations are better than others, this particular one is definitely a solid performer among them. With a deliciously juicy Peking Duck as well as tender and flavourful scallion pancakes (cong you bing) as some of their specialties, this Asian Legend is always worth a visit. Originally started as an organization to assist Chinese immigrants adapt to life in Toronto, the TCCSA has undergone a transformation to become more of a cultural exchange organization. Open to everyone, those that are interested in Chinese cultural gems ranging from calligraphy to feng shui can enrol in various courses for a small fee. They also offer Chinese martial arts classes such as wing chun kungfu, ensuring that you can burn off all those calories gained from the food court in the blink of an eye. Chuck Norris would approve.